In 1991, Cafe Septieme owner Kurt Timmermeister threw his citified lifestyle a curve, buying 4 1/2 acres of cheap, brambly farmland and a shack on Vashon Island. 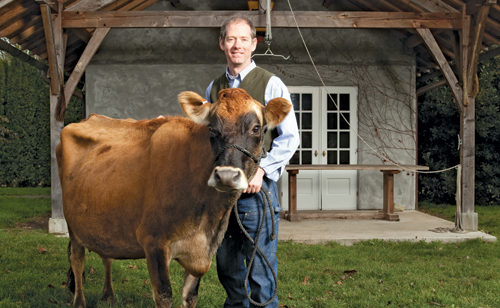 Hoping to simply have a nice retreat at the end of his daily commute, he gradually began farming the land—first vegetables, then raw milk, and currently, making Dinah’s Cheese—and in 2004 he sold his restaurant to focus on Kurtwood Farms (which has grown to 13 acres). His new book, Growing a Farmer (W.W. Norton Co., $24.95), documents the bumpy transition from running a noisy urban kitchen to communing with cows. M: How does your restaurant experience play into your approach to cheese making? KT: I know how restaurants work. I know who owns them, I know the chefs, I know what they want to buy, I know how much they want to pay for it, and I know what my labels should look like. Farms in Omak don’t understand that, even if they make great cheese. SM: Do you ever long for your old life? KT: Absolutely. Cows are a lot of work…you have to milk them twice a day, even in the snow on Christmas Day! But both the city and the farm can be difficult full time—a combination is ideal. I still go [to Seattle] once a week to deliver my cheese and spend the whole day there. It’s not like I live in South Dakota. SM: What keeps you going, given the hard labor of a dairy farm? KT: I have to! It’s not an option. I can’t just get up and leave and go to Hawaii. The animals need attention all the time. It is a contract I’ve agreed to and a huge responsibility, but I love the responsibility. I really enjoy it. SM: What do you hope readers will gain from the book? KT: I hope they are inspired to do something. That could mean buying food at the farmers’ market, or just buying a farmstead cheese instead of a factory-made cheese. It could be as simple as getting a few chickens for the backyard, or as extreme as selling your house. The idea is to get in touch with where food comes from.